Springtime In Iran Means The 'Morality Police' Are Out In Force : Parallels As Iranian authorities strengthen the so-called morality police, women are bracing themselves for extra scrutiny of their dress and behavior. Will a new, crowdsourced app help them dodge harassment? 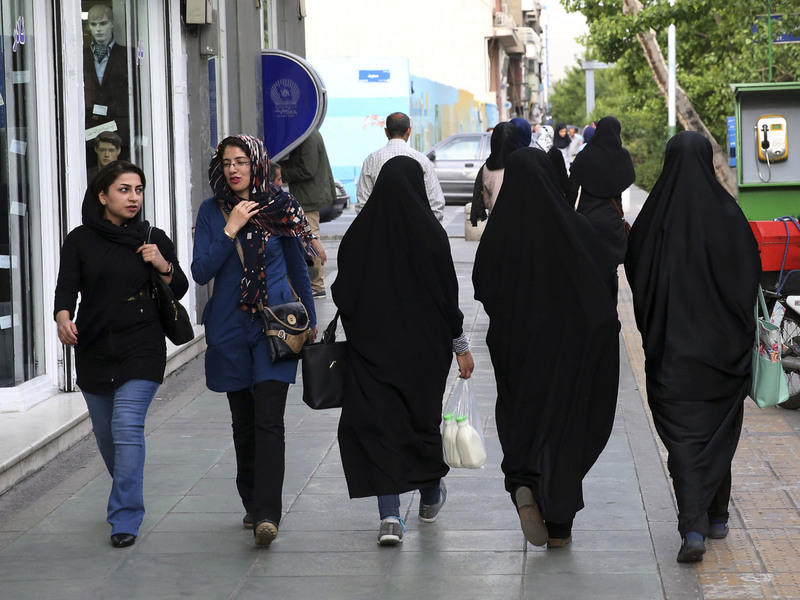 Women stroll on a Tehran street. Iranians are bracing themselves for extra scrutiny of their dress and behavior when a new, undercover morality police squad is deployed. As the mercury rises in Iran, winter coats are back in the closet, flowers are popping up — and so are the so-called morality police. Despite objections from Iran's president, Hassan Rouhani, Tehran's police have announced up to 7,000 undercover officers will be on the lookout for those who don't follow conservative Islamic modes of dress and behavior. They're called the Gashte Ershad, the "guidance patrol," and they have broad powers to chastise and even arrest people for failing to meet what might be called the modesty test. Men are occasionally stopped — perhaps if their beards are too long, making them resemble jihadists — but usually, it's women who attract the attention of the Gashte Ershad. Too much hair peeking out from under a headscarf, removing the scarf altogether in the car, taking a walk with a boyfriend — all kinds of actions can risk a run-in with the morality police (as NPR's Deborah Amos reported in 2014). Parisa, a 27-year-old researcher in urban geography and sociology in Tehran, tells NPR via Skype that some women are employed by the Gashte Ershad, but the most common sight is conservative men from the patrol harassing, berating or arresting women. Parisa asked that her family name not be used, for fear of retribution, when asked if she's had any run-ins with the morality cops. "Yes, yes, sure I have. I was stopped by Gashte Ershad two or three times, but I wasn't arrested," she says. "But my sister was arrested twice. I had to bring her some [extra] clothes to put on." The whole process, Parisa says, took about three hours. Her sister spent much of that time in the back of a van, waiting for it to fill up with others so they could be driven to police headquarters, where Parisa delivered the clothes and her sister was released. She says every woman has to make her own decision about how far to risk pushing against Iran's restrictions. Personally, she says she's careful about the way she dresses at work, but is more daring on social occasions. It's an issue that has even seeped into popular culture. The Iranian band "127" released a song called "Musighi Film" that features a verse dismissing the "summer and winter campaigns" of the Gashte Ershad. This year, in addition to the uniformed morality police, police authorities announced they would add an additional 7,000 undercover Gashte Ershad officers, spying and informing on people. In anticipation, some Iranians are excited by a new app called "Gershad." Those with Android phones can use the app to mark on a digital map places where they spot the morality police, allowing others to avoid them. Another young Iranian woman reached by Skype — a physical therapist also named Parisa, who works at a Tehran hospital — says it's good to see people using technology to fight back. She's not sure how useful the Gershad app will be, though, because it's pretty obvious where the Gashte Ershad will be — at main squares, outside shopping malls, places where they usually hang out. It's disappointing, she says, that Rouhani hasn't been able to fulfill a campaign promise to bring people relief from the morality police, but she's not surprised. "Yeah, all the people know that the real power is not in the hands of Mr. Rouhani," she says. "The main power is in another man's hand." That hand belongs to Supreme Leader Ayatollah Ali Khamenei, the man the morality police answer to. Ali Ansari, a professor of Iranian history at the University of St. Andrews, says following Rouhani's success in negotiating a nuclear deal with the U.S. and other world powers, hard-liners have fought back as the pragmatic president criticized conservative symbols such as the morality police. Ansari says reform-minded Iranians were dismayed by a series of recent speeches in which Khamenei himself took Rouhani to task. Khamenei "took real umbrage at some of the comments coming out of President Rouhani and launched a pretty full-frontal, verbal attack on the president," he says. "And this has unleashed, I suppose, a torrent of criticism and essentially a hard-line reaction." Ansari says that reaction seems to have put Rouhani on the defensive. With presidential elections coming next year, hard-liners seem determined to deny Rouhani political successes wherever possible. The resurgence of the morality police appears to be just one part of a conservative campaign to prevent his re-election.